As we’ve seen in previous posts in this series, alcohols are very versatile functional groups that participate in a variety of reactions. They can be deprotonated with base (making them good nucleophiles in substitution reactions), protonated (making them good leaving groups in substitution and elimination reactions), oxidized to aldehydes or ketones, or transformed into better leaving groups (alkyl halides, or alkyl tosylates) allowing for a host of substitution and elimination reactions. All this this versatility comes with a drawback, however. Sometimes alcohol functional groups can get in the way of other reactions we might like to do. Let me show you what I mean. Since alkynes are like a blank canvas, this reaction can set up the introduction of many different types of functional groups through addition reactions. Now let’s modify our substrate a bit. We’ll attach a hydroxyl group (OH) to the end of the molecule. Now let’s see what happens. Look at what happened – we now formed a new O-CH3 bond instead of a C-C bond. What gives? Here’s another example of the the principle at work. Here, we’d like to perform a substitution reaction of C-Br with C-C . So why does this reaction not lead to formation of a C-C bond? Same reason! Our acetylide ion is a strong base, and deprotonates the O-H group, which then participates in an SN2 reaction with the alkyl halide 4 bonds away (forming a five membered ring). This is a textbook example of what we saw in our last post – an intramolecular SN2 reaction. [Why doesn’t it do substitution first? 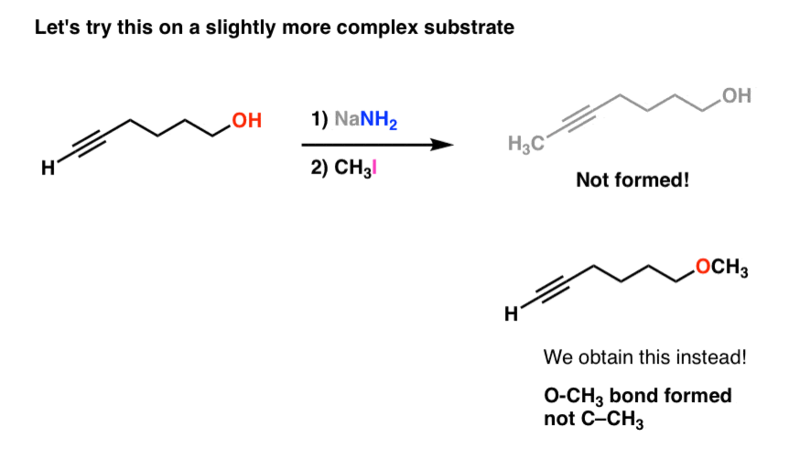 Acid-base reactions are fast, relative to substitution reactions]. So how could we have prevented this from occurring? It’s reminiscent of a problem anyone who has painted a room would understand. Imagine you’re helping your cousin paint his room in a hideous shade of yellow-green so completely uncool to the untrained eye that only a hipster could appreciate it. Then you come to one of those annoying wall outlets. You could paint over it of course. But now it’s useless if your cousin wants to plug in that 1965 Smith-Corona electric typewriter he found at a thrift store that he’s using to write his “novel”. Surely there’s a way to do this that doesn’t destroy our outlet. So what do you do? 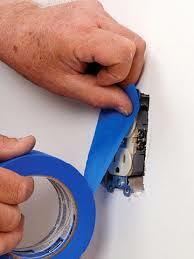 Painter’s tape to the rescue! So what’s the chemical “equivalent” of painter’s tape? 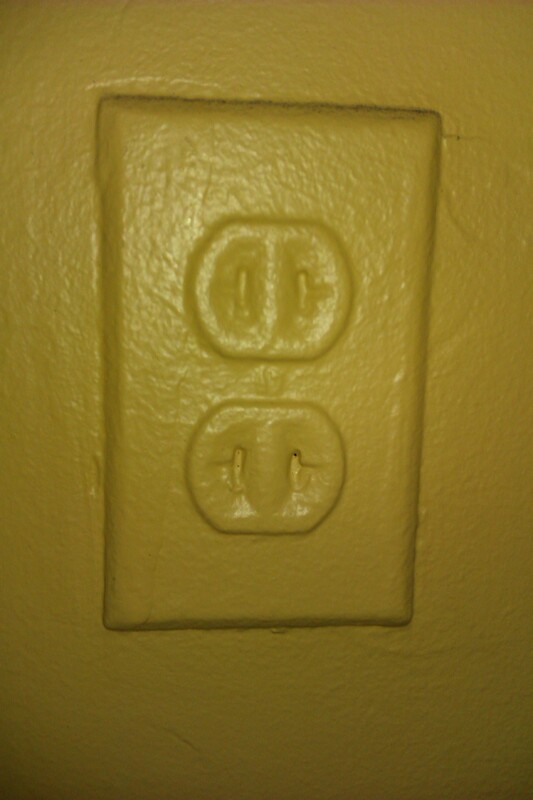 Cover the outlet with painter’s tape, paint to your heart’s content, then remove the tape. THEN you can plug in the typewriter. Simple! be easily and selectively removed to reveal the OH group once we’re done. That would allow us to perform a synthesis of our desired molecule (second scheme above). Here I’m using “PG” to stand for “protective group”. Well, you might have guessed by now that enterprising chemists have developed a solution for this problem. It’s very clever, in fact. As we’ve discussed earlier, ethers are quite possibly the most boring functional group you can encounter. The only important reaction of ethers you cover in Org 1 is how to cleave them with very strong acid (e.g. with hydroiodic acid, HI). That’s it. Other than that, ethers are inert to pretty much any other reaction condition you can name. For the chemical equivalent of “painter’s tape”, boring is good! 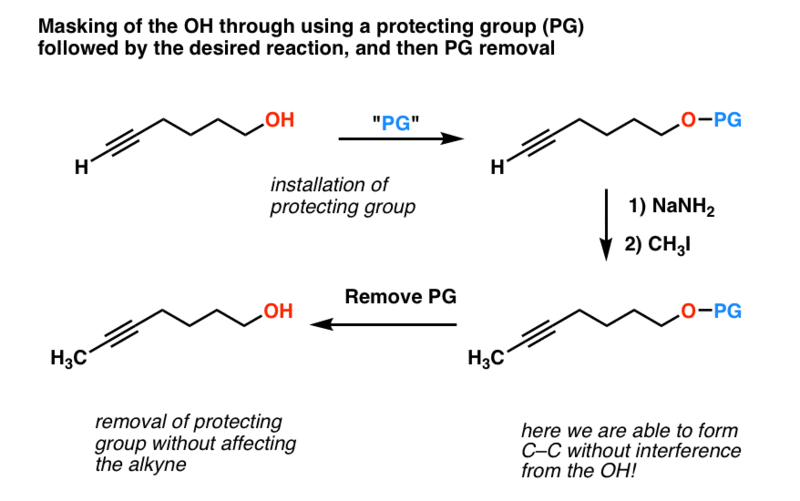 It means that we can “protect” a hydroxyl group as an ether without worrying about it being affected by reactions we might like to do on the rest of the molecule (like addition of an acetylide to an alkyl halide, for example). There’s just one problem: ethers require very harsh conditions in order to break (hydroiodic acid, HI). That’s like destroying the village in order to save it: such conditions will likely torch whatever other functional groups are on your molecule. The main advantage of silyl ethers is that they’re easily cleavable. The Si-F bond is unusually strong – even stronger than Si-O. Addition of a source of fluoride ion (F-) will lead to cleavage of Si-O bonds without affecting the rest of the molecule. 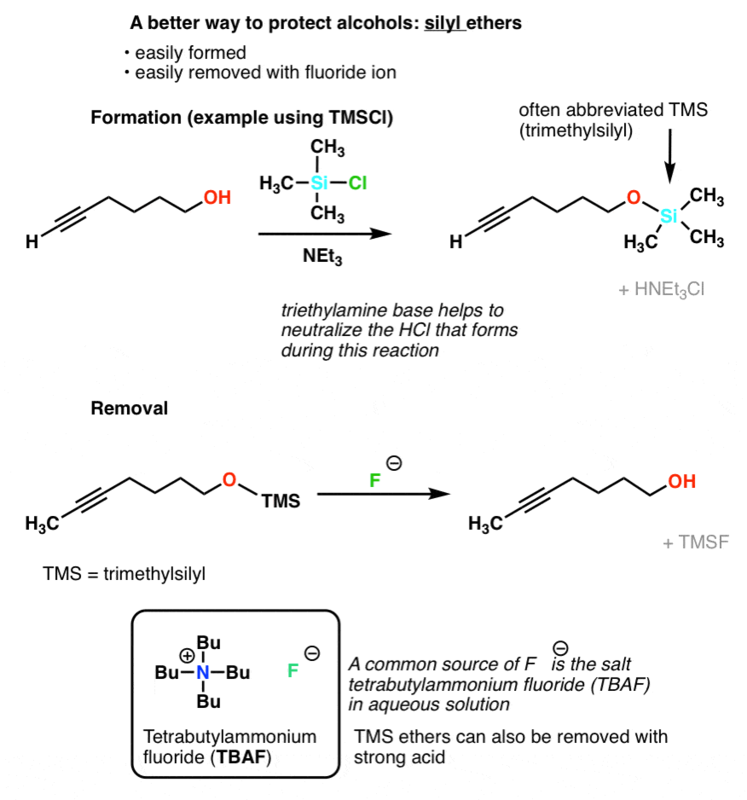 A typical source of fluoride ion is the salt tetrabutylammonium fluoride (TBAF). Are there other protecting groups for alcohols? You betcha. For more information, see Note 2. So let’s go back to our second example. How could we get this sequence to work? Let’s “protect” the free alcohol as a silyl ether (TMS) and follow along. There you have it. All we needed to get our desired reaction to work was a way of masking the OH until we were done performing our surgery on the other half of the molecule. This post barely scratches the surface of protecting groups for alcohols. 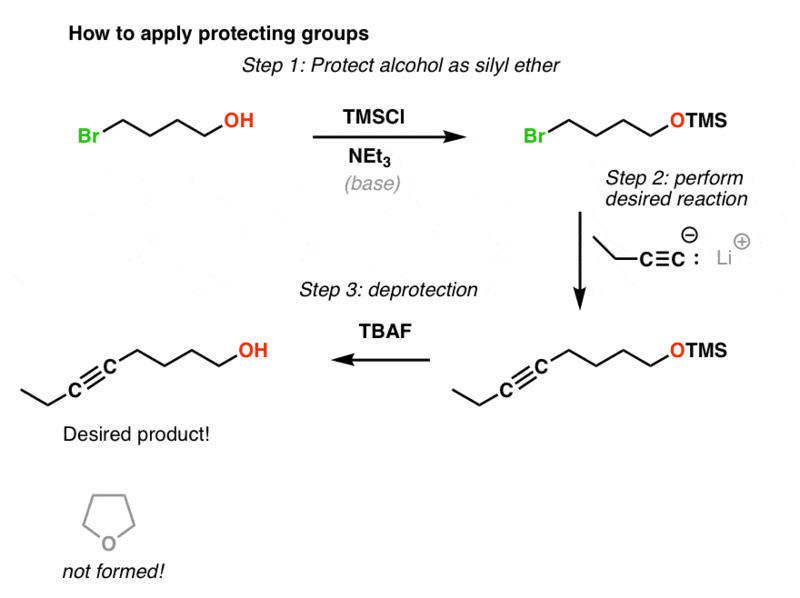 Protecting groups are used for alcohols in a variety of different situations, far beyond the SN2 examples we covered here. For instance, when we talk about Grignard reagents, we’ll see that they can’t be formed in the presence of alcohols, so we have to protect them. Another example might be if you wanted to selectively oxidize one of two different alcohols in a molecule. We can add more posts on this topic as we go along. You’ll notice that the vast majority of molecules you encounter in Org 1 and Org 2 have only one important functional group. It’s very rare that you’ll be given a substitution reaction, for example, that has two nucleophiles of comparable strength. Learning how to deal with molecules that have more than one key functional group is, in my opinion, where Org 2 ends and Org 3 begins. It’s at that point that you need to learn understand the relative reactivity of different functional groups, their compatibility with different reagents, and also how to plan a synthesis such that only one key functional group will participate in the reaction. 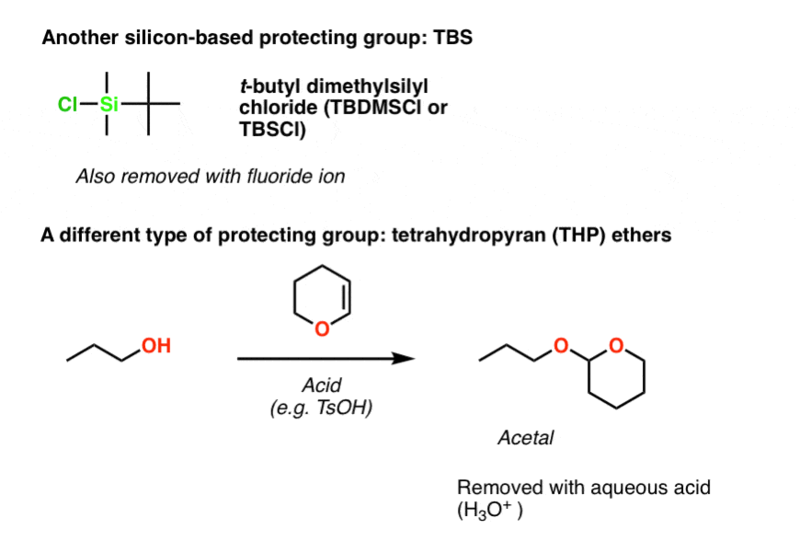 [note 2] Two more protecting groups that come up quite frequently are TBS (t-butyldimethylsilyl) and THP (tetrahydropyranyl) ethers. TBS is installed the exact same way TMS is – by using TBSCl in the presence of a base like NEt3. 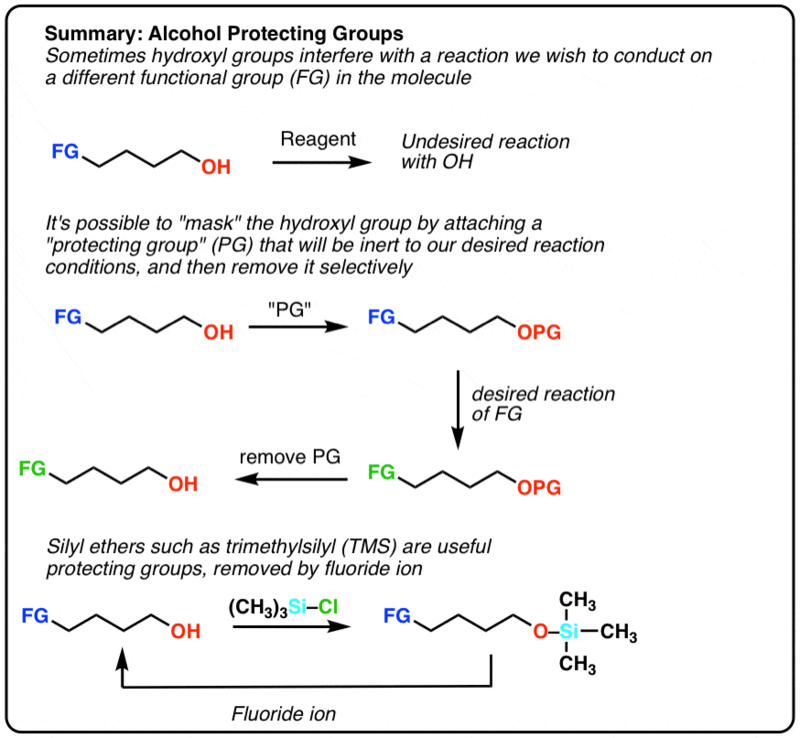 For even more protecting groups for alcohols, see this handout by the group of Andy Myers at Harvard. It’s phenomenal. Thanks for the amazingly detailed post! Love the example with the painter’s tape. I am looking for ways to protect a hydroxyl group on the bone of a molecule that has a carboxyl group at the end that needs to remain active. Is it possible to mask an OH on the bone while to acid at the end of chain remains ” active ” ? I wouldn’t say this a 100% restriction – there are likely exceptions – but if you’re being taught this, here’s at least two reasons. 1. THP protection involves using strong acid, and strong acid might protonate the OH, resulting in loss of water to form a (stable) tertiary carbocation. 2. Tertiary alcohols are quite sterically hindered, and the rate of attack of the tertiary alcohol at the electrophile produced by protonation of DHP might be slow. Thanks for the suggestion I will look into it in more details. I am trying to protect aryl OH with trimethyl silyl chloride using HMDS base. In the reaction it is showing different spot on TLC. But when we do column chromatography. It only gives starting back. Does silyl protection breaks during column chromatography? What is the solution? Please help me. TMS groups are extremely labile, especially on a phenol hydroxyl group. If you’re going to go with a silyl group, then pick TBS or something heavier. How would I protect an NH2 group during and EAS reaction and why would I need to do so?